A realtime horse made in Blender 2.5x. This model is part of a model pack that also includes a realtime cow. 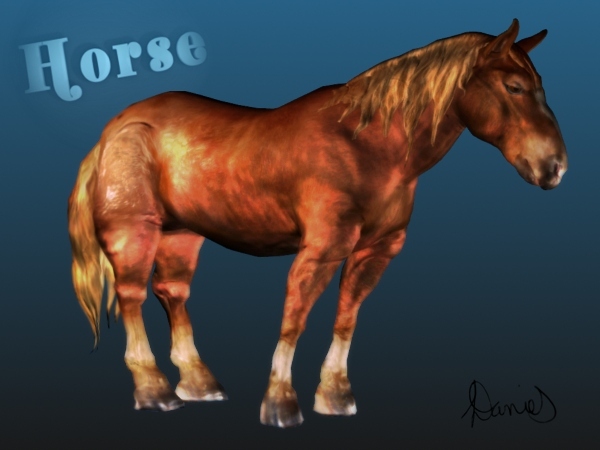 The horse is about 7.5k polys (incl hair) and the zip contains color, normal and AO maps at 2k. Animal, brown, Cattle, Domestic, Domestic Animals, equitation, Farm, farm animals, hoof, horse, Isolated, Livestock, Looking, Mammal, mane, mare, poney, pony, stallion, standing up, white background,. AwardAdmin, 2012-04-01 15:08:20 Dear artist-3d, your 3-D modeling design has been selected as a Model of the Month! Congratulations!